Tuesday-Saturday: 11 a.m. to 6:30 p.m.
Two Boots BBQ is like stepping into that classic joint on the side of the road on the outskirts of a Southern town. The kind of eat shack that looks—and smells—as if it had been there for generations. Judging from the line of folk waiting to get a hearty slab of slow-cooked meat with a side of greens and beans, Two Boots' has earned its reputation. Luckily, I have been privy to some incredible roadside barbecue in Southern states, so when I was hanging out with Two Boots owners and chefs George Lovett and chef Jordan Rhone, I was immediately taken back to a no-nonsense stand where the food was good, but the company was even better. Now, I'm not too sure what your take on the name is, but for some reason, I thought it was a play off the country of Italy. Even though it's a barbecue joint and, yes, Italy is shaped like just one boot. When I sat down with George, who hails from Florida, and Jordan, a Louisiana native, they immediately noted that both states resemble boots and, that's right, both states are represented on their signage. So that's where the name comes from. Rhone and Lovett became friends in the early '80s working for a large aircraft company, based out of Los Angeles, which eventually relocated to Tucson. After the two retired they initially wanted to operate a barbecue food truck before their current brick and mortar location became available a little over a year ago. 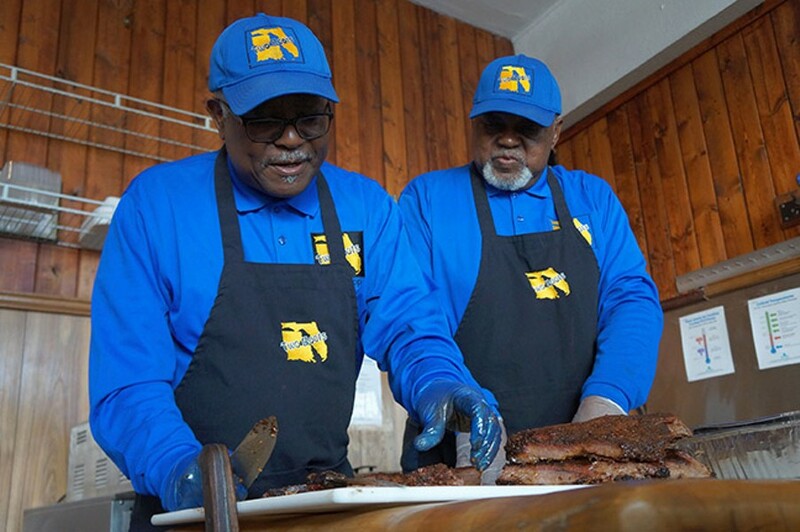 Since then, they have been churning out authentic Southern BBQ and deep-rooted soul food on South Park Avenue. Like all good Southern-vested barbecue that I have had in the past, the meat itself is a mix of dry rub accompanied by a collection of sauces, ranging from mildly acidic to full-blown, hell-spiced tang. Rhone and Lovett make their own sauces along with the secret mix for their rubs, recipes hailing from Southern upbringing and years of trial and error. As I went for the brisket, Rhone and Lovett told me that the two of them have little experience in pit work but grew up helping out in kitchens with a lifetime love of true Southern barbecue. You'd never know that they haven't been 'cuing their whole life because the brisket was supple and smoky with a perfect fat ratio, making it melt in the mouth. Highly recommended because it is massively addictive. When our conversation turned to football, Dolphins and Saints respectively, a plate of pork ribs made its way to the table. The kick of the house-made sauce honored the slide-off-the-bone tenderness of the ribs. This is carnivorous bliss that will leave your face a mess. Don't even bother trying to clean yourself up as you make your way through the ribs. It's a pointless endeavor. Just stay sloppy, my friends. The collard greens—a side item that often gets pushed aside—is the best I've had. It's also 100 percent vegetarian under the care of Lovett and Rhone. No fat back, no bacon. They let the greens shine on their own. Since collard greens can be considered an acquired taste, they offer other solid sides: mac 'n' cheese, slaw, beans and potato salad. But you need to get you some greens. Shake hands and make friends with their greens. Save room for dessert. The pecan and sweet potato pie will transport you to Louisiana backroads, listening to katydids sing and wondering if things would ever get better than this. I thought the answer was no, until I tasted the pound cake and realized that, yes, things could get better. Two Boots is the kind of place where you might walk in hungry, but you leave full and satisfied, not only with food in your belly but also with a heaping helping of Southern hospitality in your soul.